In recent news, a man who was accused of murder for causing a car crash that killed an eight-month old fetus is facing one felony charge of murder in Orange County , after evading authorities while recklessly driving with a sentencing enhancement for causing great bodily injury. The man allegedly led police on a four-minute chase that reached speeds of 65 mph on city streets after they tried to pull him over because the window tint on his car was too dark. The man then allegedly cut his headlights in order to evade officers and entered the exit ramp of an Orange County freeway where he attempted to make a high-speed u-turn, which caused him to collide with another driver at 65 mph. The woman passenger in the other car was eight months pregnant at the time and needed emergency surgery for a ruptured uterus immediately following the accident. The passenger also suffered broken bones and a concussion. The 8 month old male fetus was killed. If convicted of murder in California, this man faces a maximum sentence of 30 years to life in state prison. Penal Code 187 tells us that Murder is the unlawful killing of a human being, or a fetus, with malice aforethought. It also tells us that every person guilty of murder in the first degree shall be punished by death, imprisonment in the state prison for life without the possibility of parole, or imprisonment in the state prison for a term of 25 years to life. If you or a loved one is charged with murder as a result of an accident that killed another human being, or a fetus, please call the Orange County criminal defense attorneys at the law offices of Wallin & Klarich immediately. Don’t delay, call Wallin & Klarich and let us do our ultimate best in defending you or your loved one. We have an AV rating, which is the highest rating a law firm can possibly have, and we have the experience needed to defend our clients who are charged with crimes like this. 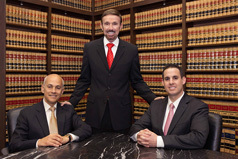 Call us at 888-749-0034 and visit our website at www.wklaw.com.